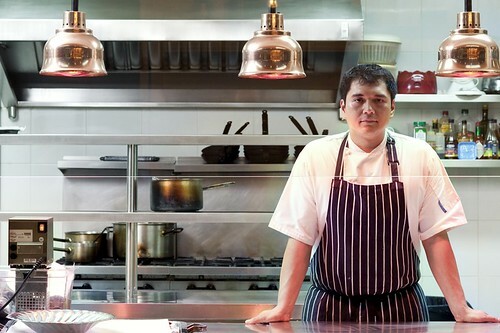 After almost eleven years of culinary education, Chef Ian Padilla returned to Manila to fulfill another chapter of his gastronomical life’s plan – the establishment of his first restaurant, Restaurant La Girolle. In this disctreetly located, thirty-seat restaurant in Bonifacio Global City, Chef Padilla creates dishes that are not only visual stunning but also delectably layered in both taste and texture. With his mastery of the fundamentals, experience from some of the finer kitchens from New York to Paris and almost an unbridled pursuit for perfection in the kitchen, Chef Padilla may have found the recipe for culinary success. Case in point, despite being less than a year old, Restaurant La Girolle was awarded 2012 Restaurant of the Year by Esquire Magazine, Philippine edition. I remember hotdogs on a stick, of course. I remember crispy fried chicken with ketchup, the banana kind. Galunggong, definitely. Galunggung with kalamansi and soy sauce – my favorite until today. I would have to say my mother. Although my mom doesn’t cook anymore but she is a very good cook. She is the one who really pushed me when I was younger. Basically, she was the one who encouraged me to go to culinary school. But I don’t think her style of food is like mine. She’s more of the home-cooked, simple type while I like my food with a little more flair, so to speak. [And] all my chefs really. Every chef that I have worked for. My cooking style today is still what I have learned from this restaurant called Ilo in New York under Chef Rick Laakkonen. The way he taught me how to do a sauce or how to blanch vegetables. I still do it the way he taught me. Chef Julian Alonzo – also in New York. He showed me how to add drama on the plate: the colors, the flowers – all that stuff. My chefs in France showed me what French food is. Done pure and simple but done extraordinarily. Describe your life on the line in the kitchens of Paris. It was really, really hard. If I was not cleaning the toilet or cleaning the mushrooms, I was probably getting yelled at – but so was everyone else. It was just hard. It was hard because…first of all the language. When I first came in I didn’t fully get it. I did not understand the sequence of service… It’s like riding a bike. It could be a big bike or a small bike. Eventually, you can ride it. [Service] was slower in Paris compared to New York. But France had an intensity because it was more detail oriented. I have always believed that it is all the same at the end of the day. Food or the produce inspires me. I think that goes for any chef really. For example, you’re in the market and see the best tomatoes, first thing that comes to mind – we have got to make a nice tomato gazpacho. Or you see fresh basil – let’s make an excellent pesto. That’s what inspires me. Second, of course, are books. Books by chefs, my idols. I think every serious cook should have a copy of Larousse Gastronomique. My personal favorites are Essential Cuisine by Michel Bras, White Heat by Marco Pierre White, Charlie Trotter’s Vegetables and James Patterson’s book, Sauces. What made you decide to open you Restaurant La Girolle? It was 2001. I really had a ten year plan. Go to culinary school. Work here [in Manila]. Work in New York. Go to France and then, open a restaurant. I was very fortunate to be able to follow all of that. After ten or eleven years of earning minimum wage, I think it was about time to get a salary increase by opening my own place. At the end of day, is it not every chef’s dream to open a place to call their own? To really showcase what they have learned and transforming that into your own self. What is your philosophy on the plate? What ideas do you try to communicate when creating a dish or a menu? I’ve always believed that at the end of the day what you put on the plate never lies. When I do the dishes here we always think about simple things. For example, a mushroom soup. Everyone has done a mushroom soup already. But what do we do to make it different? Instead of just using regular shitake, why don’t we use four different kinds of mushrooms – all wild, all local. Let’s [also use] dried mushrooms to intensify the taste. Let’s deglaze it with white wine and add fresh thyme and bay leaf. Puree with lots of cream. What do we do to take to the next level? What do mushrooms go well with? They go well with garlic. Let’s add a confit of garlic. Mushrooms go well with truffle. So let’s make a truffle foam. We have good flavor but we don’t have texture yet. So what do we do to add texture? We saute some mushrooms in olive oil and garlic. So we now have textual contrast but how do we take to another level. We add cheese and mushroom ravioli. It starts with simple ideas first and we just build on it. You set high standards on the plate. How does that translate into the kitchen and in the front of the house? I have to tell my cooks how things are done. Problem is, I think that as Filipinos, we are tigas ulo [hard-headed]. It takes a while [for things] to sink in. I am strict in the sense that if you are not going to do it right, you are going to do it twice. I think I have developed a reputation of being cruel in the kitchen, so to speak. But when we charge these prices, things have to go out properly. We can’t send out burnt fish. We can’t serve meat underdone. And cooks have to know that and they have to have higher standards for themselves. [With regards to front of the house] eventually, all chefs have to be managers also. They have to greet the guests. They have to ask the guest how they enjoyed their food because my palate is different from the next person’s palate… So just by talking to them, hearing what they want is another factor on how restaurants can be great. As a guest, if you’re spending this much, it is always nice to know that the chef came out to talk to you, asked you what I thought of his food. You would give him your suggestions and he listened politely. If you had a great time, you would definitely come back. It’s a circle. It works for everybody. What is your favorite dish on your current menu? I can tell you what my most hated dish on menu is. It’s the 48 hour, sous vide short ribs. So sick of it already. [I can’t take if off the menu] because people love it. I’m a visitor from out of town. Where would you recommend I go for breakfast, lunch, dinner and after dinner drinks? For breakfast, we go to a French bakery for croissants and coffee at Le Petite Artisan or Lartizan. That’s still my staple. For lunch, it would definitely be Filipino food. If it were my friends from France, the last place I would bring them to would be a French restaurant. If it were my friends from Chicago or Wisconsin, I would take them to Dampa so that they can try real seafood. I would definitely make sure that they have good Japanese. I would definitely make sure they have local beer. I would make sure they try mango with bagoong. And sisig, of course. I will take them to Gilligan’s, for the best sisig in town. In my opinion, [Gilligan’s] beats Trellis any day. I am a connoisseur of sisig. What’s your most memorable restaurant meal? Local or Foreign. I was fourteen years old and ate at Le Souffle for the very first time. It was still under Chef Billie King in the late eighties. I believe I had lamb. It came out with this weird plating and little slices. It was delicious. I said, yup, I’m going to be doing this [become a chef]. Well, I could never afford the expensive, three Michelin starred restaurants. Not on my salary. I was always eating in the cheaper places. But there was this restaurant in Cork, Ireland, a seafood place. Excellent oysters. They had mussels that we were really, really good. What is your junk food indulgence? I don’t eat junk food. I have not eaten in McDonald’s for over a decade. What is the food you love to hate? I’m not a big fan of prawns or lobsters. I don’t like the texture. Even if I cook it, I still don’t like it. I’m also not a big fan of foie gras either. But if there was one food that I love, it would be caviar. I love caviar. I hate truffle oil. It’s a waste of money. I’ve seen the real truffle oil. But when you taste it, there is really not much taste to it. It’s really a smell thing, in my opinion. What I find sad is when restaurants make something mediocre, jazz it up with truffle oil and charge so much. What would your last supper of your life? Sisig, rice and lots of beer. [The sisig] has to crispy and from Gilligan’s. We are going to establish a bistro; a wine and cheese bar. We want to have a seafood restaurant/French cafe. We want to have a real sandwich bar. Imagine a pork belly reuben, stuff like that. I would like to have a real small bistro where I cook food that I want to -minus all the flair. For example, braised ox tail with mashed potatoes. No need for extra this and that. Just straight up food like that.